The Holy Grail of Double IPAs? I’ve thought long and hard about this beer since I tried it for the first time last month and I’ve actually been dying to write about it. 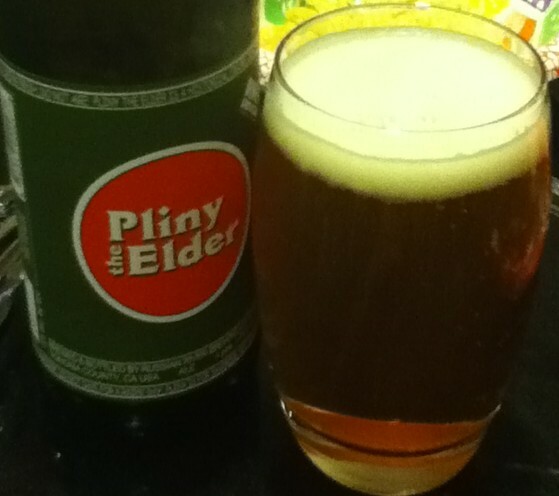 Pliny the Elder and all of the famous Russian River brews are hard to acquire, especially for a Canadian. I was fortunate to meet up with some friends in Las Vegas recently and one of my good buddies brought this gem for me. Often considered the best beer in the world, limited output and limited distribution keep this rarity in demand. At first I kind of assumed that the fact it was hard to get was keeping Pliny the Elder at the top of most popular beer tasting sites. It wasn’t until I tried it for myself that I discovered it was more than hype. This oddly shaped 510ml bottle has a very simple but oh-so-recognizable label with the bottling date right on the label! Once poured this beer emits a brilliant smell, I always encourage everyone to give their beer a sniff but this is really beneficial when it comes to IPAs. And what an IPA we have here! Well, double IPA. In fact the first double IPA produced in the world was apparently created by Russian River’s part-owner Vinnie Cilurzo at his first brewery Blind Pig(just a little beer history here folks). So what does a beer created by the man that invented the style taste like? Heaven, or as close as I’ll ever get to it. Now this probably seems like pretty bold words and it’s pretty naive seeming of me to stroke the ego of an already extremely popular brew but it really is that good. There are beers that get really close to the profile of Pliny the Elder but considering what Pliny looks like in the glass I can’t believe the flavour that comes from it. It pours really clear and clean with no sediment and not much in the way of colour compared to some of the other DIPAs I’ve had. This beer really has an amazing nose though. The first sniff you give it really sets the tone for the over all flavour which is extremely smooth and not at all boozy despite its 8% ABV. I would say balanced is a really great way to describe this beer. It is definitely a hop bomb, there’s no doubting that, and there are beers on the market that are more hoppy but certainly not as balanced or interesting. There is the classic grapefruit peel, grapefruit flesh and pineyness that is very prominent with this beer but for me it was all about the aftertaste. Smooth, delicious with not as long lasting or palate bruising as other more intense hop bombs. I haven’t looked into many reviews of Pliny but I’m going to say there is somehow a very interesting and prominent honey sweetness to the aftertaste. Not sweet in residual sugar, or overwhelmingly, but sweet in a subtle way; if you’re tasting for it, it’s there. For beer lovers like myself this is one to experience. I’m planning a trip to Santa Rosa already. Yes, it’s that good.